Guest reviewer Adam is here to help me out on a line I don't cover well - Stikfas! He'll have a couple guest reviews over the next week or so on these spiff little fellas. Take it away, Adam! Though straying from it’s original vision a tad, the Stikfas line (purchased and now distributed by Hasbro) has continued to grow this past year. 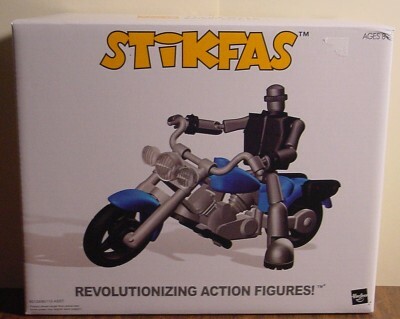 For those who don’t know, Stikfas are 3 inch highly poseable and extremely customizable “Action Figure Kits”. Out of the box they look more like a model than a toy (to say some assembly is required would be an understatement), but they are the toy customizer’s dream product, and perfect for a toy enthusiast parent to assemble and customize for his children (perfect, that is, if the price were lower). Today I am reviewing the Stikfas Alpha Male w/ Motorcycle deluxe AFK. The 12th AFK (for those who are keeping score), The Alpha Male with Motorcycle shows where the original vision is being left behind. 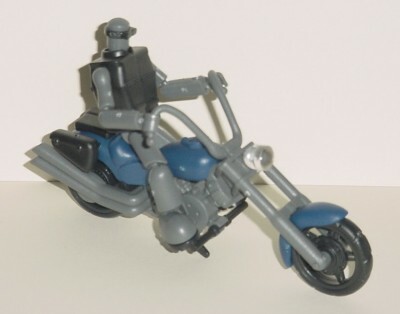 Designed to be used with any other 3 inch figures and their accessories and vehicles (GI Joe would be a perfect example), Hasbro has made these figures more standalone, with the Motorcycle being the first of what might possibly be many official Stikfas vehicles (depending on sales no doubt). The oddly shaped box brightly displays the yellow Stikfas logo, and a 3D rendering of the action figure that awaits inside. The back shows the actual contents of the box, as well as a few pictures of the figure posed for those of us who need ideas on what to make ours look like. Though the box does look nice (if not a tad bland with all the white space), collecting these and not opening them would be quite the waste of money, since there’s no way to see the actual figure inside (as it’s not assembled yet). However the boxes do look nice on display. The pieces come in a ziplock type bag inside the box, handy for the extra accessories if you don’t want to keep a big pile of boxes. This won’t hurt my overall very much, as Stikfas themselves only have about 4 different “sculpts” (the male, the female, and the boy). With no accessories, STIKers, or paint, Stikfas are very minimalist looking. 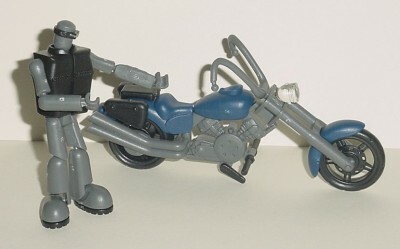 The Motorcycle on the other hand fits very well with the look of the rest of the line, but when compared to most other toy motorcycles, it’s lacking a lot of detail. This is done on purpose though, as they are meant to be customized in some way. Not Applicable? That’s right. Stikfas actually aren’t painted. They are made of solid colored plastic, as again, they are meant to be customized. This is the other selling point of Stikfas, the articulation. Every joint is a ball joint, 14 points of articulation in all (head, shoulders, elbows, wrists, waist, legs, knees, and ankles). The Motorcycle itself turns with the handlebars, the optional kickstand moves up and down, and the wheels spin. Because of their size and light weight, Stikfas can pose in pretty much any position (I’ve included a picture of the early military figures to demonstrate). Besides the very cool Motorcycle, this kit comes with a jacket (made of a plasticy material), 4 different helmets, a pair of sunglasses, a shotgun, spike wristbands, and various pieces to change the motorcycle (3 different headlights, 2 handlebar variations, 2 different kickstands, 2 sets of different sized wheels, and some seating variations). 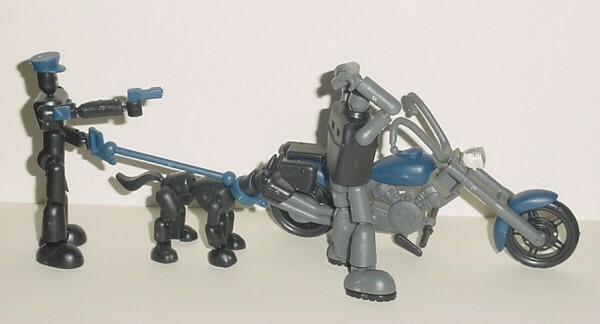 Even with the motorcycle, there is very little in the way of accessories in comparison to the Stikfas deluxe Omega Knight with Stallion kit, which had all sorts of armor and weaponry. My score of three stars however is based on other figure lines, which still can’t touch the 20 or so little things this figure comes with, and Stikfas collectors have no shortage of weaponry (the original Military figures came with about 10 different guns) if they feel the need to arm their biker with something other than a shotgun. The kit, like all Stikfas AFK’s, also comes with instructions, 2 collectable post cards, and a STIKer sheet (decals for those who don’t want to paint their figures, but don’t want them to look too bland). As I said at the start, Stikfas require assembly. All of the pieces have to be broken off their plastic frames, and snapped together. I usually use a pair of pliers for this, to avoid the little plastic nubs that are inevitably left on the pieces, but some can’t be helped, and as you can see by my pictures, I’m far too lazy to sand them off (Stikfas.com has some suggestions for doing this). For a first timer, this can be frustrating (hence the one star), but once you’ve assembled a few, they aren’t so bad. This particular kit has no frustratingly small pieces (if you had to assemble the wings of the Dragon kit, you know what I mean by small pieces and frustration), so everything snaps together quite easily. This is where Stikfas take a huge hit. With even the new GI Joes only costing about $10 US for 2 figures, (I’ve seen them here in stores for $11 Canadian), Stikfas are extremely expensive for their size and the fact that they have no paint or excessive sculpting. 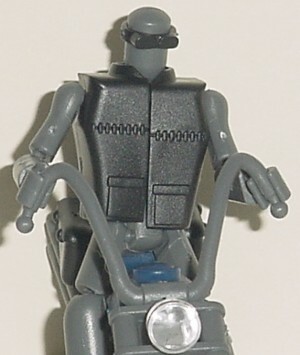 The Alpha Male with Motorcycle, as well as all the deluxe figures, cost me $23 Canadian at my local comic shop. That’s for 1 Figure, and 1 Motorcycle, that you have to assemble yourself. The single figures cost $12.99 Canadian, or an average of $9.99 US (from what I’ve seen), which makes it tough to make an entire army of military figures, or two feuding biker gangs in this case, especially if you add in the cost of paint (if you were to go that route). They aren’t the most enticing line for collectors, due to their price point and the lack of detail out of the box, but Stikfas are a very cool 3 inch toy. To paraphrase the Lays potato chip slogan, you can’t buy just one, once you get your first Stikfas kit, you’ll want more (providing your wallet can handle it). Entertainment Earth has this kit for $17.99 US (though they are currently out of stock as of this writing, but they have more on the way). Silver Snail in Canada has this kit for $26.99 Canadian. As a sidenote, Planet Action Figure does not have the Alpha Male with Motorcycle kit, but they do have the Omega Male with Stallion kit for $9.99, and the Delta Boy Extreme for $5.99, which are extremely good prices in comparison. The Rater: Hello toy collectors and fellow Stikfans, the name's Adam, and I've been collecting figures now for only about 2 years or so, starting with a World of Springfield Chief Wiggum that was sent to me by a guy I was dealing with at the time for free along with some merchandise that had arrived about 6 months late (I curse him every day for the amount of money I've spent on toys). Since then, my collection has grown to over 130 WoS figures. I also collect McFarlane Matrix, other McFarlane figures that catch my interest, and of course, Stikfas. Figures from the collection of Adam.